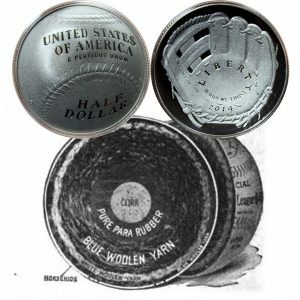 Today, the Baseball Commemorative Half Dollar Coin remembers the approval of the new cork-centre ball patent on August 31, 1909. The 1910 base ball season witnessed the introduction and perfection of the greatest improvement made in that most important part of the game, the base ball, in a quarter of a century, with the result that, at last, we have secured the much-demanded and much- needed increase in batting, without submitting the playing rules to the risk of radical changes; indeed, without the change of a single word in the Playing Rules Code bearing upon the pitching or batting. This improvement in the ball, so simple yet so far-reaching in its effect, was the substitution of a cork centre, invented by Mr. Benjamin F. Shibe, for the solid rubber core heretofore always in use and considered indispensable. The cork centre has given more durability and far greater elasticity, thereby appreciably increasing the batting without affecting the fielding. For proof of this grand fact we have but to scan the official batting averages of the American League and the National League, published in this issue of the Reach Guide, and to compare the same with the averages for any one of the last twelve years, since the introduction of the foul-strike rule. This comparison will reveal the gratifying fact that the team batting and the individual batting averages have been augmented fully 20 percent, that the number of .300 batsmen has been greatly increased, that the extra-base hits are more plentiful, and that the grand batting average of each major league has been increased at least 20 points. In the face of this astonishing fact we also find the fielding averages are actually higher all along the line than in 1909! That this grand result is solely due to the ball, and not to league or individual improvement, is shown by the fact that the batting increase is evenly distributed among all of the players, and is in about the same proportion in the American League and the National League, both of which used only the cork-centre ball last year in all championship games. Patents fully covering this novel invention were granted the A. J. Reach Company on August 31 of 1909. Even before that time tests were made in league games all over the country, unknown to the players. Every base ball turned out with the cork core gave the greatest satisfaction. Instead of a solid rubber centre, which has marked the highest grade base balls since the early 80’s, cork with a heavy covering of pure Para Rubber now takes its place. Officials of the A. J. Reach Company, which makes more base balls than all other manufacturers in the country combined, are jubilant over the success of the cork centre. The radical change from rubber to a cork centre marks a new era In the manufacture of base balls. Cork centre makes a better base ball — better for the fielders and for the batters. The new Reach creation is far more durable than the old solid rubber centre. For years the brightest minds of the great Reach factory have been working to solve the problem created by occasional cracking of the rubber centres. Despite the use of the costliest and most perfect Para rubber, the solid core occasionally broke under the terrific strain. This would eventually burst not only the multitude of yarn wrappings, but the horsehide cover as well. Perhaps only twenty or thirty a season — but enough to make the Reach Company seek a superior substitute. Exhaustive experiments proved cork the finest of all material, and today the new ball stands supreme against the slightest criticism. In weight, in size, it is absolutely as called for by the official rules. Its construction is shown in the illu tration on the Reach Company’s advertisements elsewhere in this issue of the Reach Guide. Cork does not make the ball the slightest bit harder, but it does make it less yielding. The Reach winding machines are now set to greater tension and the ball becomes firmer and of uniform resilience never before realized. The rigidness and durability now secured are in remarkable contrast to the old style ball. Another interesting fact is the increased snappy “crack” when the new ball is hit. This is entirely due to the rigidity of the construction made possible by the cork centre. This new core is indestructible and yet provides even truer and better resilience than the solid rubber core; and by so much will make slightly better batting without affecting the fielding in the slightest degree. And so, with the addition of this simple device, the Reach Company can now proudly and justly claim in the Reach Ball the ideal of their labors and ambitions — the long-sought absolutely perfect base ball — an achievement upon which the Reach Company is to be heartily congratulated in view of their quarter-century quest for the seemingly unattainable. The Baseball Commemorative Half Dollar Coin shows with an image of the cork-centre ball of 1909-10.